Black garlic has been used for many years in Asia both as an ingredient in recipes and because of its health benefits. The black bulb happens due to fermenting raw garlic through prolonged exposure to heat and humidity. Black garlic has a sweet and mellow flavor with an inky hue. Recent studies have found that black garlic is an excellent way to lower LDL cholesterol which is the bad cholesterol. Lowering LDL is essential to reduce the risk of heart disease, stroke, and premature death.The compound S-allylcysteine, a natural component of fresh garlic and a derivative of the amino acid cysteine, was found in much greater concentrations in black garlic One study found that participants who took black garlic extract daily for 3 months increased their good cholesterol while significantly lowering their LDL. The allprotein B in the blood lipids was lowered which is a strong indicator of lowering of heart disease risk. We have all been told about the antioxidants in garlic but researchers have found that black garlic contains twice the antioxidant properties. 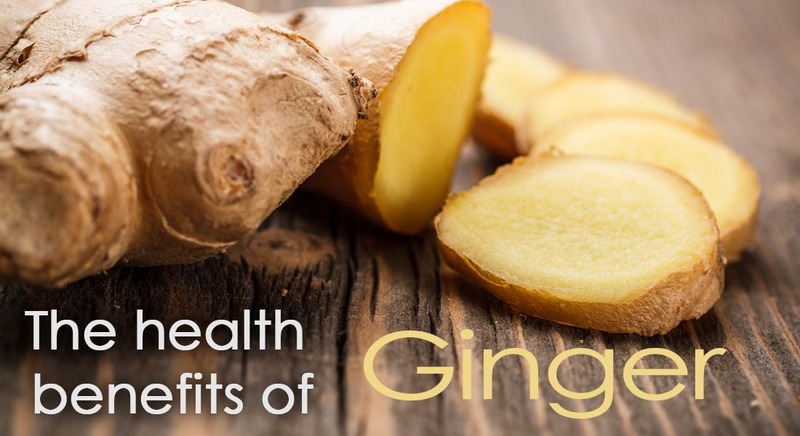 These antioxidants are the protectors of the cells from disease and may slow down the aging process. Studies are being conducted to find out how effective black garlic is at battling chronic disease. 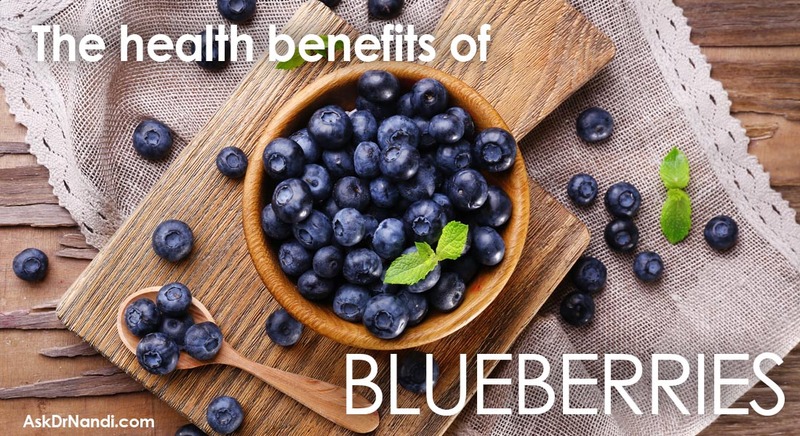 Researchers believe that the high levels of antioxidants with offer protection to the free radicals that cause the damage. Free radicals damage the cells and help cause heart disease, rheumatoid arthritis, Alzheimer’s and other chronic diseases. Black garlic contains allicin which is the compound that is responsible for garlic’s health benefits but contains 30 times less of S-allyl-cysteine which can be toxic in large amounts. Research has found that a person can eat more black garlic with no real side effects. 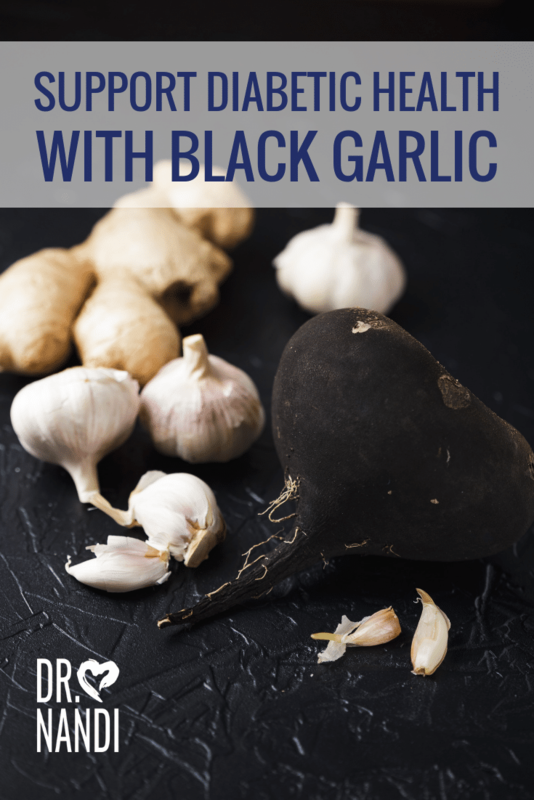 Black garlic contains phosphorous which helps to build strong bones and teeth, facilitate nerve conduction, filter out waste in kidneys as well as other functions. Researchers have found that black garlic contains other vitamins and minerals such as magnesium, calcium, selenium and the Vitamins B-6 and C.
Black garlic has been found in studies to aid in regulating blood sugar levels and may potentially decrease the effects of some diabetic complications. 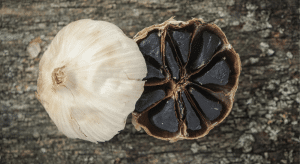 In a study of diabetic rats, the black garlic proved helpful in the overall health of the rats by reducing the complications from atherosclerosis and nephropathy. The rats had lower blood sugar levels, cholesterol and triglyceride levels when fed the garlic. Compared to the control group of rats, levels ranged in lowering from 30 to 50 percent. Another study done on humans, found that the garlic when eaten by type 2 diabetic patients, saw improved blood cholesterol levels. The LDL was lowered and the HDL was elevated compared to those who were fed a placebo. You’ll love Dr. Nandi’s Black Garlic Tomato Sauce! 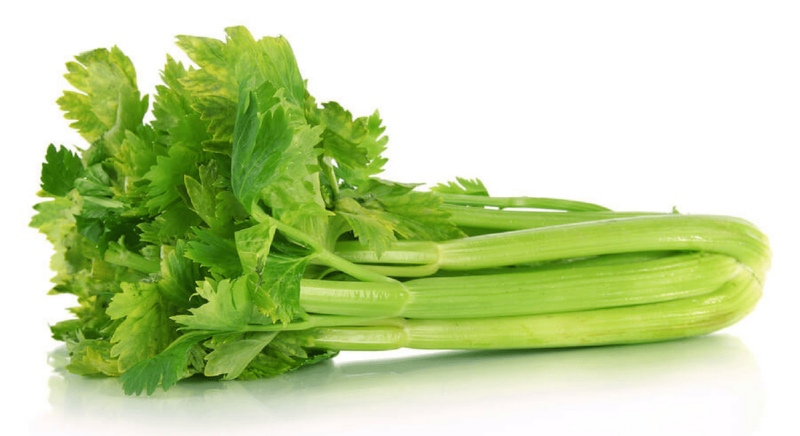 Add it to Zucchini noodles for a meal fit for a Health Hero! Black garlic is safe for most people but may cause some problems if consumed. Black garlic may cause heartburn, gas, nausea, vomiting and diarrhea. 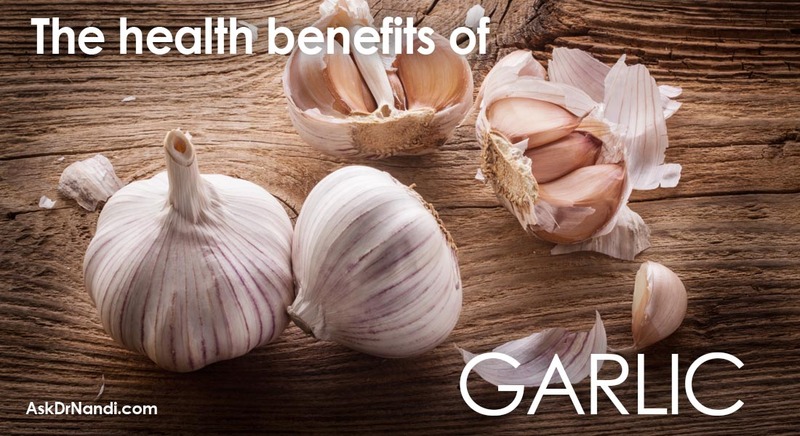 Garlic may also increase the risk of bleeding. Black garlic is thought to be safe if eaten in amounts normally found in food but may be dangerous if used in medicinal amounts.